On their newest CD, DREAMING IN COLOUR, Jump5 blend the same enthusiasm and intensity of their past recordings with a new maturity and conviction. The album features the group's best vocals and hook-driven melodies to date. Under the guidance of producers Mark Hammond (Josh Groban, Amy Grant, Nichole Nordeman, Brian McKnight, Luther Vandross), Dan Muckala (Mandy Moore, Joy Williams, N'Sync, Point Of Grace, Aaron Neville) and Shaun Shankel (writer/producer of American Idol finalist Kimberley Locke's smash single "Eighth World Wonder"), DREAMING IN COLOUR allows Chris, Brandon, Brittany and Lesley to flex their notably strong vocal muscles on some of the year's best hit-worthy pop sounds. "This album is a lot more even and balanced, musically speaking," says Brandon. "It's not heavy on just guitars or just pop sounds, but it's got a good, even spread of it all - and that's what we wanted. We offered a lot more input throughout the entire recording process this time around. That's why it really feels like it's our album." DREAMING IN COLOUR features songs written by Stuart Brawley (Don Henley, 'N Sync, Celine Dion), Steve Diamond (Britney Spears, Backstreet Boys, Faith Hill), Rob Cavallo (Green Day, Goo Goo Dolls) and even Jump5's own Brittany Hargest, who co-wrote "Feels Like Falling," her first recorded song for the group. 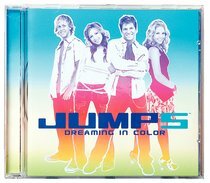 From top to bottom, Jump5 effectively expands the parameters of teen pop, making a successful evolution from song to song with the infectious hooks of tracks like "Just a Dream" or the album's title cut, which the group says became the fastest album title they'd ever agreed upon. "This song is really about not dwelling on the bad things in life, but seeing the good," says Chris. Listeners will connect quickly with the powerful guitar-pop sounds when DREAMING IN COLOUR kicks into hyper-drive on head-nodding tracks like "In My Heart" (co-written by Brawley and Michelle Tumes) and "It's A Beautiful World." And some will be familiar with the catchy pop classic "I Got the Music In Me," with its explosive new Jump5 spin that is sure to be a favourite at dance parties everywhere. Taking a stand that's both inspirational and heroic, Jump5 continues to be at the forefront of the new "tween" revolution, setting the pace not only for their fans, but for some of their fellow artists who now present a more clean-cut image with empowering messages about self-esteem, self-confidence and the importance of being comfortable with who you are - common themes that Jump5's audience has always responded to in a very big way.